The ' Nellie E Saloon' (aka Desert Bar) is five miles down a windy, rocky and dusty dirt road and definitely worth the bumpy effort to get there. 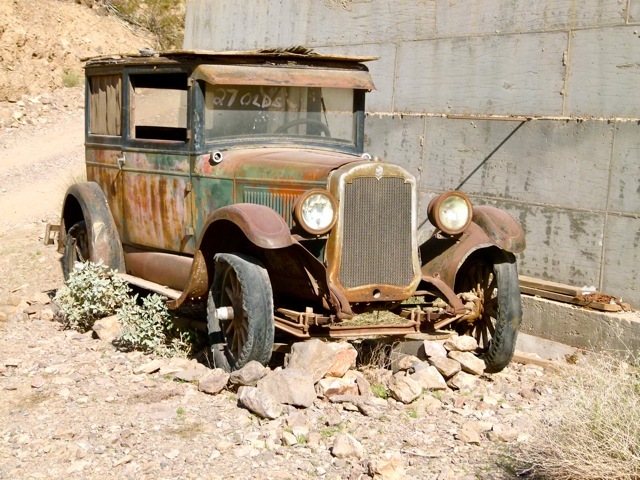 This fine piece of history sits in the Buckskin Mountains, north of Parker, Arizona, on land that was an old mining camp. The bar was first opened in 1983, in a temporary three-sided structure. It lasted for five years until the current saloon was constructed. The name "Nellie E" originates from the old mining claim where prospectors mined copper and then took it to a smelter and hopefully got gold. These days the 'gold' comes from the hundreds of people that make their way each weekend to this solar-powered oasis. If you value your RV, do not take it down this road. Besides, there is no room to park it at the Nellie E. When we were there we saw one truck/camper. We drove our 4-wheel drive pickup. 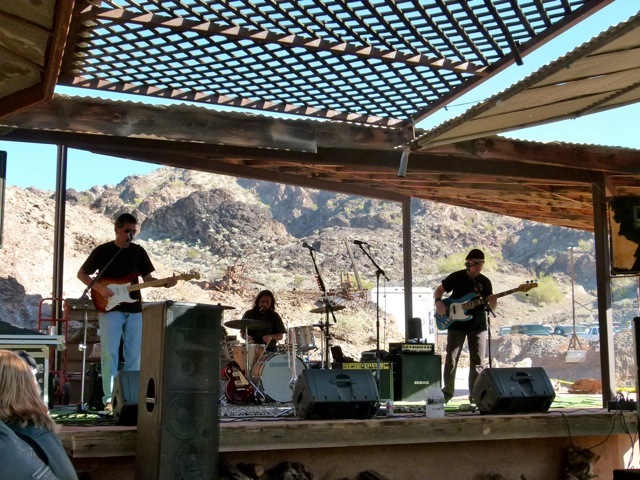 Each Saturday and Sunday, October through April, depending on the weather there is live entertainment from 1-5 p.m. The Cell Phone Cowboys were performing the Saturday we made the five mile adventure on Cienega Springs Road. Hours: Open October through April, Saturdays and Sundays only from high noon - 6 p.m., Arizona time, and holidays during these months. The bar is closed during the hot summer months. Refreshments: There is simple food for reasonable prices. We had a passable hamburger for $3. Both hard and soft drinks are available. Full bar. Families welcome. Bring cash, no credit cards accepted. Directions: 5 miles north of Parker, Az. on Hwy 95. Take Cienega Springs Rd. east 5 miles, follow the traffic. The road ends at Nellie E's. 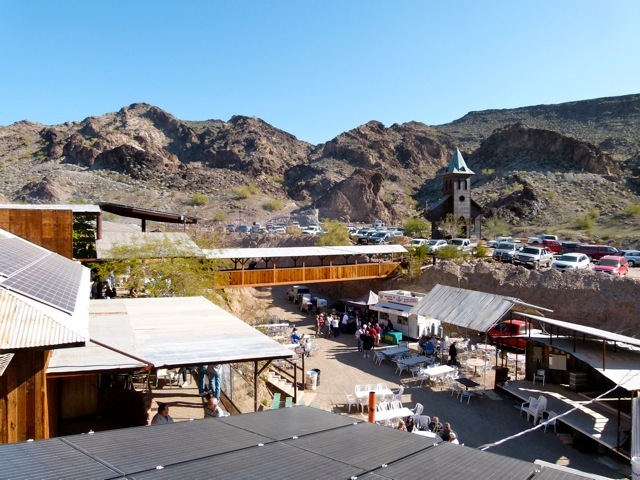 Buckskin Mountain Desert Dash -- Each year during the President's Day weekend, the Nellie E Saloon hosts the annual "Desert Dash," a 5-mile walk, run or mountain bike trip out to the solar powered bar. Registration area -- On Feb. 13, 2016 at Hwy 95 and Cienega Springs Rd., between 8-9:45 a.m. The "Dash" begins at 10 a.m.
For more information telephone (928) 669-2174 or (928) 667-2829. For additional information on the "Dash" and other local fun happenings go to Parker Area Tourism. 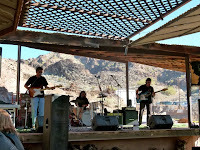 Everytime we are in Quartzsite over a weekend we drive to the Desert Bar for a fun afternoon. Did it in a GEO Metro for three years. So just about any vehicle but and RV will make the trip. Lot's of fun and mostly good music. Nice people, too. Thanks for your comment. It is a very fun place and getting there is part of the bragging rights. We go every year and love it! I if you go during January, be prepared for huge crowds..but, that is all part of the fun! Be sure and visit the bathrooms..something you will not see any where else..it's a bumpy ride, so take your time and enjoy! We also visited via a GEO Metro. A little bumpy but no problems. Enjoy every visit. Been going since the last Century. Lot's of fun and friendly people.